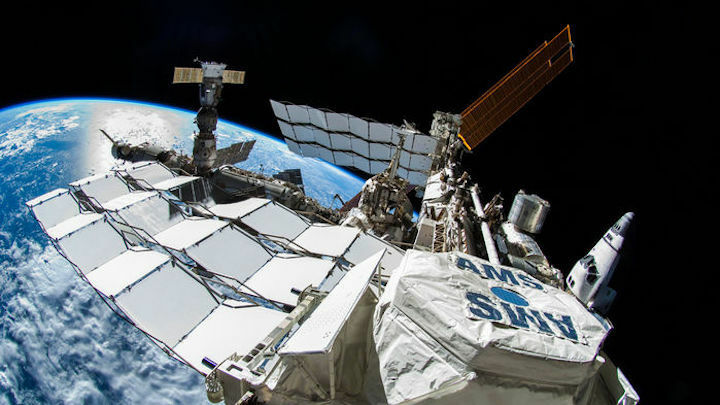 A costly and controversial space-based cosmic ray detector has found possible signs of dark matter, the invisible stuff thought to supply most of the universe's mass. Or so says Samuel Ting, a particle physicist at the Massachusetts Institute of Technology in Cambridge and leader of the Alpha Magnetic Spectrometer (AMS), which is perched on the International Space Station (ISS). However, time is running out for the aging detector, and many researchers are skeptical about the dark matter interpretation, which Ting dances around with typical coyness. "If you listen to the storyline, it does sound like that's where we're headed, but we never quite get there," says Angela Olinto, a cosmic ray physicist at the University of Chicago in Illinois. In 2014, AMS researchers reported an unexpected flux of positrons that kicked in at energies above 10 giga-electron volts (GeV) and seemed to fade by about 300 GeV. The excess could come from dark matter particles colliding and annihilating one another to produce electron-positron pairs, and the energy of the falloff might point to the mass of the dark matter particles. Now, with three times as many data, AMS researchers have clearly resolved that energy cutoff. 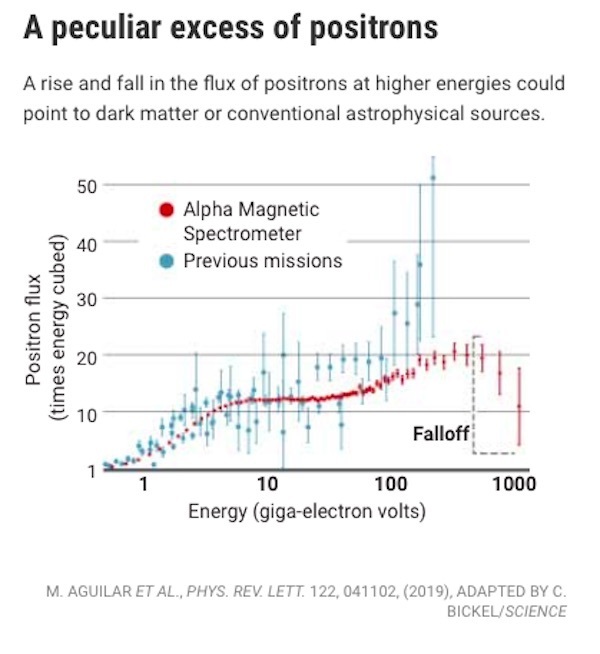 The positron excess starts at 25 GeV and falls sharply at 284 GeV, the 227-member AMS team reported last week in Physical Review Letters. "It's important because you do start to see a turnaround" in the energy spectrum, Olinto says. The cutoff is consistent with heavy dark matter particles with a mass of about 800 GeV, the researchers report. The AMS paper acknowledges that dark matter annihilation is just one possible explanation for the positrons. They could also come from a mundane astrophysical object, such as a pulsar—a spinning neutron star. But Ting emphasizes the steepness of the cutoff. "The cutoff also goes very quickly, very similar to [the signal from] dark matter collisions," he says. In a third possibility, the positrons could come from the interactions of cosmic rays themselves. Cosmic ray protons emerging from remnants of supernova explosions regularly slam into atomic nuclei in interstellar space to create "secondary" cosmic rays, including positrons. AMS researchers say they've ruled out that explanation for the signal, because the proton collisions should produce a long tail in the positron spectrum instead of a sharp falloff. But Greg Tarlé, a cosmic ray physicist at the University of Michigan in Ann Arbor, says the AMS data reveal a telltale similarity between the energy spectrum of the positrons and that of the protons, supporting the idea that the protons are the source. "It's the AMS data itself that give the best evidence for the positrons being secondaries," Tarlé says. Every explanation for the positron excess has significant problems, cosmic ray experts say, but Ting insists the AMS may still sort it all out. The detector could run for the remaining life span of the ISS, perhaps until 2024. The AMS team will then have twice as many data, enough to tell whether the positron spectrum dives as steeply as dark matter scenarios predict, Ting says. Stephane Coutu, a physicist at Pennsylvania State University in University Park, disagrees. Doubling the data will shrink the error bars just 30%, he says, too little to resolve the issue. "They're basically done," Coutu says. "The rest is gilding a lily." In May 2018, a federal advisory panel reached a similar conclusion. In 2017, the White House proposed slashing DOE's research budget by 17%. In response, officials in DOE's high energy physics program, which funds the AMS's $4.5 million operating budget, held a review to rank 13 ongoing projects. The AMS tied for last. The problem lay not with the experiment, but with the theories to interpret its data, says Paul Grannis, a physicist at the State University of New York in Stony Brook who led the review. The theoretical uncertainties are "so big that anything you could do to improve the data will have very little impact," Grannis says. In the end, Congress boosted the 2018 high energy physics budget by 10%, and DOE officials say they have no plans to cut the AMS. Ting is also holding out for a different jaw-dropping discovery: heavy antimatter nuclei. It would be huge because antinuclei heavier than a deuteron—a proton and a neutron—cannot be made in cosmic ray interactions and would have to originate in some region of the universe dominated by antimatter. Ting claims the AMS has captured a few antihelium nuclei. Coutu says a mountain of evidence already proves no antimatter regions exist, so the unpublished signals must be spurious, perhaps produced by misidentified helium nuclei. The antimatter claim, too, may remain untested. Despite last year's reprieve, the AMS faces an uncertain future. Pumps that cool key detector components need replacing, and the fix will require a spacewalk, scheduled for October. "It's no big deal," Ting says, although he won't guarantee success. If the AMS stops working, it will leave behind an outstanding legacy, even if it's not the one Ting envisions. The detector has collected exquisite data on cosmic rays such as nuclei of helium, boron, beryllium, and carbon. The data are helping scientists understand what produces these ordinary cosmic rays, and how they journey through space. "The cosmic ray data that they're producing is fantastic," says Tarlé, often a vocal critic of Ting. "It wouldn't have been done if Sam hadn't convinced DOE and NASA to do it."